Venus Flytrap - While this plant is named for the goddess of love, it can enhance your spooky garden because it eats insects. Flytraps are native to the Carolinas, but now they are almost in extinct in this area. They are not difficult to take care of but there are many misunderstandings about how to take care of them. You will find they grow in the summer and fall and go dormant in the winter and then bloom in the spring. When they go into dormancy many people think that is it for this plant but this is just a natural part of their plant cycle. Venus Flytraps thrive in moist soil and need to have access to spiders and insects. 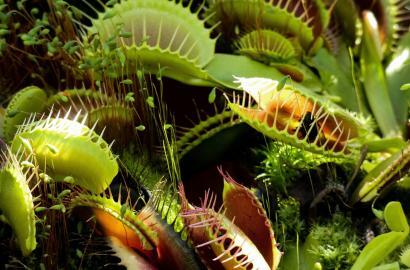 Some flytraps have been known to last 30 years. 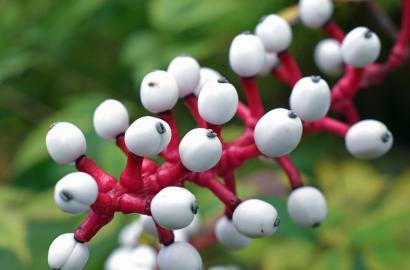 White Baneberry – This plant is also known as White Doll’s Eyes and from the photo, you can see that is what they look like. This plant is a part of the buttercup family is a perennial. The berries are white with deep purple almost black dots (pupils) and the branches are a pretty dark pink. When you see the plant, it looks like someone is watching you. White Banberry blooms clusters of white flowers in May or June. The plant prefers moist well-drained soil. It does best in full to partial shade. The plant is extremely poisonous – so beware. 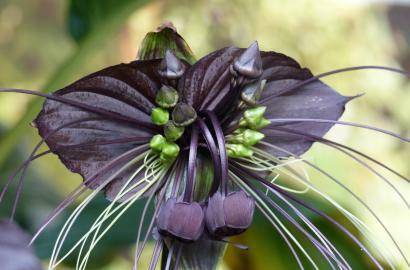 Black Bat Flower - This flower with its black color and outgrowths of ears and whiskers is one of our scary plant winners. This plant grows wild in China but to grow it in the United States it needs some TLC. Black Bat Flower needs partial sun or filtered light, warmer temperatures and good air circulation. The plant can be planted in a clay pot (at least 6-inches) to keep the root system healthy. It will grow two to three feet and blooms from late spring all the way until early fall. This plant loves humidity and hates the cold, so when it starts to get chilly better bring the plant indoors. Euphorbia Milii – This plant is also called crown of thorns and is a woody, succulent shrub that has bright green leaves, with red or yellow flowers and the scary part – think sharp blackthorns (measuring ½-inch long) which cover its water storing branches. Euphorbia Milii is winter hardy for zones 9-11. This plant can be grown as a houseplant and it will grow 2 feet tall. As an outdoor plant, it can grow 3 feet tall. 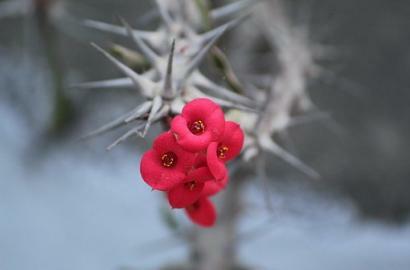 The plant is easy to grow but does not do well in cool temperatures (below 35 degrees Fahrenheit). It will tolerate dry soil but adding moisture will help with enhancing the blooms and keeping the leaves from falling off. When working with this plant, make sure you wear gloves. When trimming the plant, the sap is toxic and can cause rashes. 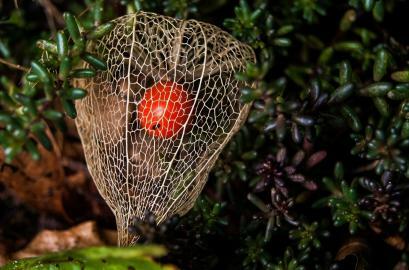 Chinese Lanterns – In the late spring, this plant produces tiny, white, star-shaped blossoms followed by balloon-like green shells that turn papery, orange husks in late summer. The husks dangle from 2- to 3-foot-long stems, look like brightly colored oriental lanterns. The bright orange blooms look great against the green foliage. This perennial plant is hardy for zones 4 – 8 and requires little care. It is also pest-resistant. Be careful, in rich soil the plant may become invasive. It is similar to when you grow Mint. You can also try growing this plant in a container so when it gets cooler you can bring it indoors. All parts of the plant are poisonous, even though the ripe fruit is considered edible. Celosia (Cockscomb) Flower – All varieties of Celosia have fuzzy flowers, but the Cockscomb Celosia is very unique. 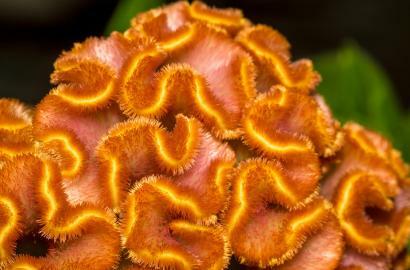 It looks just like a brain and Brain Celosia is another name for this plant. The Cockscomb blooms are made up of numerous tiny flowers and the flower blooms from late summer through late fall. The flowers are beautiful in bloom, but they can be dried easily if hung upside down. In zones 10 and 11 the plants are considered perennials. In other zones, they full sun annuals. Cockscomb does best in hot, slightly dry conditions, but will wilt if overly dry. They do not tolerate the cold well. Avoid wetting the flowers or leaves to prevent fungal diseases. The plant falls under the category of edible ornamentals; definitely a yummy treat for Zombies.